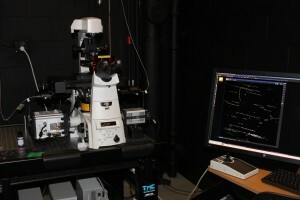 Description: The TIRF is used to study fluorescently labelled molecules in a very thin region of the sample adjacent to the coverglass. With a depth of up to ~100nm, this technique is well-suited to examine, for example, individual molecules, cell membranes, and other cell surface processes. The Nikon Eclipse Ti-E TIRFM is equipped with several lasers: a 405nm, 488nm, 561nm, and 640nm; and two digital cameras. The Zyla 5.5-CL3 sCMOS camera is great for live cell imaging. The iXon Ultra 888 EMCCD camera is very sensitive and good for single molecule detection. Training includes a lecture, a demonstration, and hands-on microscope instruction.